Valentine’s Day was celebrated on a Saturday where we took our own sweet time cruising around the mall. 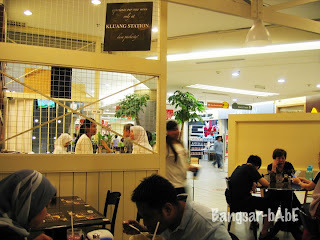 Came 4pm, I was insanely hungry so we went for tea at Kluang Station, 1 Utama. I ordered my usual; the Hainanese Chicken Chop while rif opted for the nasi lemak. We both had Iced Coffee. My chicken chop arrived 5mins after placing our orders. rif’s dish followed soon after. I guess that’s because there was not much of a crowd that time. The freshly fried chicken chop was deliciously crispy on the outside. A thick piece of juicy chicken thigh was revealed beneath all that crispiness. The sweetish tomato sauce with garden peas and baked beans was perfect with the already scrumptious chicken. I enjoyed mopping the sauce with the crinkle-cut fries that came with the dish. 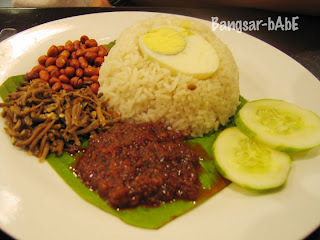 rif’s nasi lemak was alright. Fragrant coconut milk infused rice with spicy sambal and crunchy ikan bilis, I kept thinking we should have got some chicken rendang to go with…hehe. The “kao” coffee concluded our satisfying tea break. The bill cost RM 22.44 after tax and service charge. I like dining here as the food is quite good (at least for now) and reasonably priced. 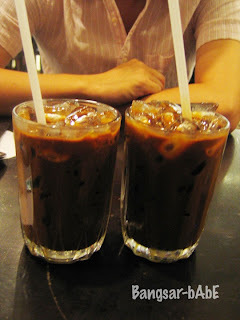 Verdict: One of the better kopitiams around. Quite an ideal place to dine in if one is on a budget and sick of fast food. I would say that this is the most reasonable place to eat in 1u that taste quite good with reasonably big portions. Congrats to the ppl down south for branching out to KL. Looking forward to more.